Arrival information for 3 lines downtown split across two SMS messages, displayed on an iPhone. Update: This service is no longer supported. 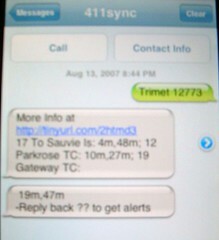 We recommend TriMet’s TransitTracker by Text service. For each line at the stop, you get the line identifier, terminus and the times of the next few vehicles. xrl.us provides even shorter links. The tinyurl piece is done by 411sync, not be us. If you have an iPhone (which I do as well) why the heck would you want to do this through SMS? You have a full web browser! I’m just embedding the popups that Tri-Met gives you on their site into one page, so I can see what the options are. The individual embeds refresh as long as the phone doesn’t go into standby, and if it does, that’s what the page refresh button is for. I’m sure that there’s probably more dynamic and elegant ways of doing what I did here, but I’m not a web developer, and I’m certainly not going to do Tri-Met’s job for them, even though this is exactly the kind of thing that keeps people from using transit – no reliable information about when the vehicles are going to arrive. Dadnab provides full itinerary information (not just stop times) via text messaging (SMS). To the person who questioned why anyone would want to use SMS when they have a full web browser: think of a Post-It Note. A text message makes a better Post-It Note than a browser page, because it’s stored in an inbox, and you can refer back to it easily whenever you wish. Disclosure: I created and operate the Dadnab service. worked as advertised. I found this because I was going to build one myself (or try anyway) but “trimet” had been reserved at textmarks. Much faster to just find it! You guys rock. 41411 with “trimet 199” did work, however, and was pretty prompt. And why would people want a text based one? Because I have a phone that texts and calls- I don’t wanna pay for internet, and it’s a basic phone. Not everyone has an iphone/droid/etc. dabnab, seems to work as advertised, nice little app to have on your phone, not all folks have an iphone though. like me ! The service wasn’t working at all when I tried it today. TriMet’s apps page is linking here, so it might be a good idea to deal with that somehow. Alexis, by “the service” do you mean TransitTracker by Text? I haven’t seen any other comments about this problem over the weekend and it’s working (for me at least) today. Details? Jeff, Alexis is referring to a service we used to offer before you guys started delivering arrivals by text. I’ve put up a note that we’re no longer supporting it, and have asked Bibbiana to remove it from the TriMet Apps page.